The Lofted Barn is our most popular barn. It is available in 8', 10' and 12' widths (14' & 16' width available in some areas). The 8'-side model features a single shop-built door, the larger models include a double shop-built door (shown). All models come with a convenient loft that provides additional upper storage. Windows are not included. Z-Metal buildings are ‘s premium metal building. 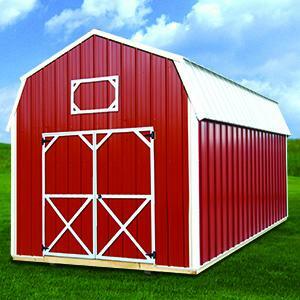 Our high quality 29 gauge metal is hung vertically in the style of a traditional metal barn or pole barn. Available in a range of siding and trim colors, you can customize your building any way you want! If you’re looking for the best metal portable building available today, look no further than the Z-Metal building. Floor joists are 2×6’s in 10′ and 12’ withes, 16 inch on center and set into notched skids to prevent twisting. Floor joists never span more than about 5 ft without being supported by a 4×6 skid. Floor Joists are 12 inch on center on all Garages.